Note: This review encompasses the one player experience of Rise of the Dark Spark only. “For the love of–! What in the–arrgh! ?” Half completed bellows of frustration, sounds of anguish and the repeated exclamation of “I quit!” could be heard coming from my office all weekend. No, I didn’t have an advanced screener of Transformers 4: Age of Extinction, I was playing Rise of the Dark Spark on the Xbox 360. I really enjoyed the last two games in the War for Cybertron series, I worked my way through War for Cybertron and really enjoyed it. Fall of Cybertron has unfortunately been brushed aside and pushed farther back in my queue, though, due to my late-acquired Skyrim addiction. It’s not Fall of Cybertron’s fault. It’s a darn fine game in its own right and, by reputation alone, the best Transformers video game of all time but I’ve been hooked by Skyrim like no other game has hooked me in the last decade. Fall of Cybertron will be revisited and completed, I promise. I have to do it. I’m the host of the world’s first (best and most awesome) Transformers podcast, plus an all around Transformers loving guy. But, man, I love Skyrim. When Rise of the Dark Spark was first unveiled at Toy Fair 2014, I had some concerns. It was, by all accounts, a Transformers movie game with the War For Cybertron universe tacked on. Transformers movie games haven’t had a great reputation and the fact that this was a movie tie-in with only four-ish months of notice was disconcerting. Thanks to Activision and some diligence on our part, we were able to get our review copies on launch day. Not all outlets received copies and concerns were expressed from other media outlets that this was due to a lack of confidence in the game. There is probably some truth to that. Rise of the Dark Spark has so far proven to be a disappointing entry in the War for Cybertron series. It’s developed by Edge of Reality and not High Moon Studios, the developer of the previous two games in the series. High Moon Studios’ status seems to be unclear. Its website hasn’t been updated in more than a year. The studio developed a Deadpool game which was released in 2013 and is developing the 360 and PS3 versions of Call of Duty: Advanced Warfare. Unfortunately the absence of High Moon Studios in the game’s development has been to its detriment. 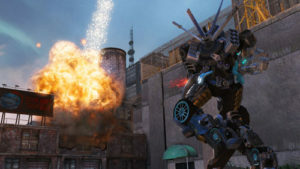 Overall the gameplay is nearly identical to the earlier games, there are no major innovations gameplay-wise with Rise of the Dark Spark, other than the introduction of Gearboxes. In the game you play as characters from War for Cybertron, Fall of Cybertron and the new movie, Transformers 4 Age of Extinction. Enemy encounters are tedious and frustrating. Obstacles must be passed by defeating enemies and performing mundane, unimaginative and often frustrating tasks. Early in the game you play as WFC Soundwave and you must eject Rumble so that he can navigate his way through a conduit to disengage locks which obstruct your way. Repeatedly you have to eject him, wait, fight, reload him, walk to the next conduit and eject him again. This happens multiple times in the course of the encounter. The whole game is full of these obstacles and their boring and tedious solutions. The graphics and sound are passable. I didn’t expect a lot in this respect and the game delivered on those expectations. On Earth textures can be flat and boring. Levels taking place on Cybertron bear the familiar look of the previous games. The voice acting is lifeless and repetitive. Earlier games in the series feel alive, but the voice acting in Rise of the Dark Spark has more dark and less spark. The game is very much a movie tie-in, albeit with a different plotline. If you wish to engross yourself in the next game in the War for Cybertron storyline, then you will probably want to wait for the next game to come your way. Rise of the Dark Spark has one goal and that’s to cross-merchandise. If you can’t get enough of Transformers video games and you’ve played them all (including the Famicom and Famicom Disk System games) then you might want to pick up Rise of the Dark Spark. Be warned, it can be frustrating but it does contain new Transformers fiction. If you’re a certified Transformers nut like we are, then maybe it’s worth your time. If not, then skip. Wait for the next War for Cybertron game, when and if we ever get one.